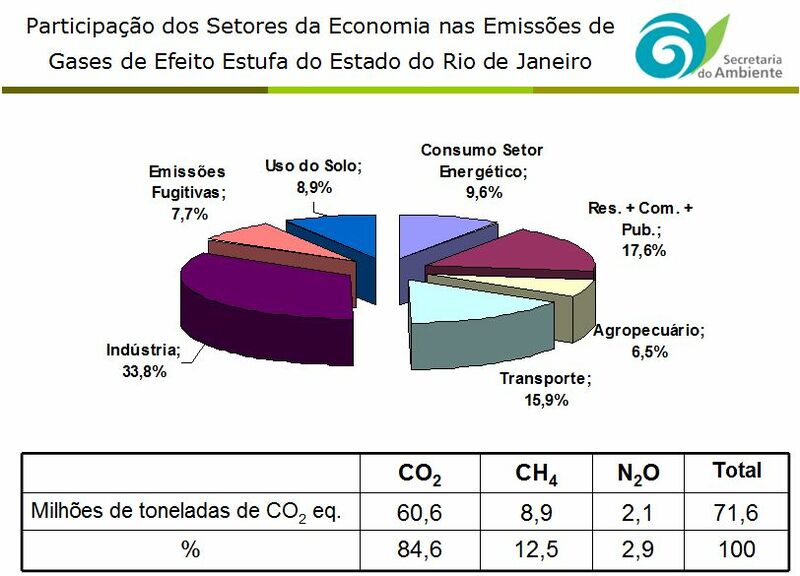 By sources, the biggest GHG emitter in RJ is industry at 33.8%, followed by the residential-commercial-public sector (presumably mostly due to energy use, but that is not clear) at 17.6%, transport at 15.9%, the energy generation sector at 9.6%, changes in land use at 8.9%, fugitive emissions at 7.7% and agriculture at 6.5%. Contrast that with the figures from Minas Gerais’ recently released state GHG inventory, wherein agriculture and land use accounted for over half, and industry only 5.8%! RJ state says it emits 71.6 million metric tons of carbon dioxide equivalent (CO2e) in GHGs annually. The overwhelming GHG released in RJ state is carbon dioxide at 84.6%, followed by methane at 12.5% and N2O at just 2.9%.